Author: Birte Kathage. Series edited by: Axel Fleisch, Wilhelm J.G. Möhlig. 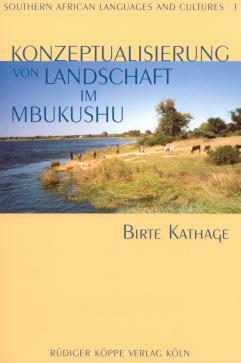 Mbukushu is a Bantu language which is spoken mainly along the Kavango river in the Northeast of Namibia. The major items of the landscape are the Kavango river, lined with fertile floodplains and river terraces, and the Kalahari sand plateau which is partly covered by woodlands and parallel drainage channels of dry rivers. During her fieldwork the author collected linguistic and non-linguistic data on the conceptualization of this semi-arid landscape. The data collection was carried out on the basis of linguistic and cognitive anthropological methods. The findings of the study lead to the conclusion that the mental process of conceptualization is based on universal cognitive principles which leave open cultural variation within outer limits. The methods of data collection and analysis are suited to identify and systematically describe culture-specific variation. Thus the study contributes substantially to the compilation of an empirical basis on conceptualization which is suitable to further develop explanatory approaches for a theory of cognitive linguistics and in particular of cognitive semantics. Its first and foremost merit […] is that it provides a comprehensive picture of how Mbukushu classify the land and water that forms their natural environment. In the book this picture is summarized in a fold-out diagramme that is a model of the cognitive map of the Mbukushu. The book itself may be read as an account, lucidly written, about the way to compile such a map-diagramme for a particular language. As such it is of methodological and theoretical interest also to those working outside the region. […] it is through accessible and systematic case studies such as the contribution reviewed here that theoretical problems emerge more clearly and are most productively discussed.